There’s no reason to completely let your zero waste guard down when it comes to stuffing those stocking this Christmas. Here are 9 great Zero Waste Stocking Stuffer Ideas to get your eco-friendly juices going! I was really happy when I found car coasters! What’s a car coaster to might ask? They’re little coasters that go in the cup holders in your car! Genius, I know. I wish I would’ve invented them. There are two in our current car and I’ll never go without car coasters again. These little things are eco-friendly, zero waste, and would be a great addition to your stocking stuffer crew this year! The best part is they’re under $10! Do you use essential oils in your home? I do! These little bottles are a great zero waste stocking stuffer AND it’s a gift that keeps on giving! Through SimplyEarth.com, you can buy a single bottle of oil for as little as $6.99! You might feel this is rather inexpensive, and you’re totally right! Simply Earth is not an MLM (Multi-Level Marketing) Company so they’re able to sell their oils at an inexpensive, fair price all while still upholding the best, most pure form of the oil. I’ll be telling you more about this company soon, but for now, I invite you to try them out by clicking the picture below. 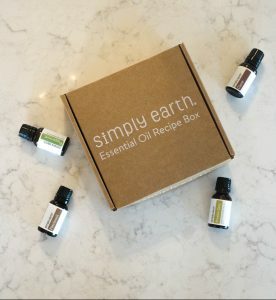 If you decide to try their Simply Earth Essential Oil Recipe Box (I 100% recommend! ), use the code TGAHFREE to get a $20 gift card towards your next purchase. If you hang out here often (on my blog), you might be tired of me bringing up reusable straws…but I’m going to say it again: THEY’RE GREAT! These sleek, cute straws are forever zero waste and are the perfect shape to stuff in a stocking. You can also pair them with the next great stocking stuffer below for the “full package”! Let’s establish an important fact here: I use this exact tumbler at least three times a week…and way more if I admit to the amount of iced coffee I drink. Not to knock YETI, because I love that they were the little guys and worked their booties off to climb up the ladder, but I just can’t afford such an expensive tumbler (Honesty only here, folks!). Someone suggested to me to try an RTIC and I was sold, sold, sold! I own one 32 oz. tumbler and two 20 oz. tumblers. I can fill them up with ice water, leave them in the car all day on a hot Florida summer day and it still has ice. That’s pretty impressive! Pair them with a reusable straw and they’re zero waste. Depending on the size of the tumbler, they stuff quite nicely down the neck of a stocking, too. I also use these quite often in my home. These little bags are great because, one, they’re zero waste and reusable, and two, they are super stylish. Russbe has themed bags for children or a nice solid look for the adults in the zero-waste community or chooses to pack their lunches! I send these baggies full of fruit or cut up meat for my husband to work. My next purchase will be the quart and gallon bags to free food in. Russbe bags are zero waste, reusable, well-made, and affordable. Sometimes it’s hard to work towards a zero waste house because money can be tight, but these affordable bags make great stocking stuffers and will help you on your way to a zero-waste lifestyle in no time! Honesty Hour: I totally stole this one from my mom. She stuffed Silly Cow Farms Hot Chocolate to your stockings one year and I never forgot about it! I gift this hot chocolate to my step-dad almost every year because it’s just that good. Posted below is their Chocolate Truffle flavor or buy the Silly Cow Farms Sampler Pack of 4 Different Flavors! In total, they have 13 flavors…which is just spectacular if you ask a hot cocoa feen *wipes drool from mouth*. Their products are all natural, “Made with the finest, pure ingredients available” and also Non-GMO Project Verified, certified gluten-free and made with NO corn or high fructose corn solids. It says on their website this hot cocoa is also non-dairy, nut free, and has no artificial growth hormones! So there’s no need to be worried that you’re mainly drinking chemically enhanced hot cocoa. Also, this cocoa comes in a glass bottle! Luffa Sponges are all the hype right now. If I had to bet, most of us have used luffas before, mainly in soap form. If I had to make another bet, you think they come from the ocean as I did. Well, I grew them over the summer and I’ll never, ever buy another regular sponge again. That’s right! You can grow these glorious gourds in your back yard, peel them, let them dry and never have to buy a sponge again. Luffa sponges are a wonderful zero-waste stocking stuffer because they’re small and once you’ve used them until they’re falling apart you can just throw them in the compost! If you don’t compost and decide to throw them in the trash, they’ll at least break down nicely because they’re just a plant. These facts make luffa sponges the perfect gift for the green household and non-green household. Raise your hand if you love tea! I have all this wonderful loose leaf tea that my mother gifts to me a while back and one of my favorite tea strainers is this cute little stainless steel bloom with a daisy on it! You twist the strainer/infuser part off from the daisy, add your loose leaf tea, screw the daisy back on, and pop it in your warm water to float and infuse for the allotted time. This little tea infuser also comes with a plastic cup to put the strainer when you’re ready to drink your tea! After you’re done using (and reusing) your tea grounds, they go in the compost. Zero waste and small enough to stuff in a stocking! These are on my Christmas list this year! I’m constantly forgetting what I planted where, no matter how many charts I draw out! Surely, I’m not the only one…right? These GardenMate Plant Labels are sleek are reusable, lasting season after season and helping you remember that yes, Chelsea, you definitely meant to plant cabbage there. I also love how classy the copper version looks! You can buy these garden labels in a pack of 10, 25, or 100 depending on how much space you have or, like me, how forgetful you might be. Have you ever received one of these items as a gift? 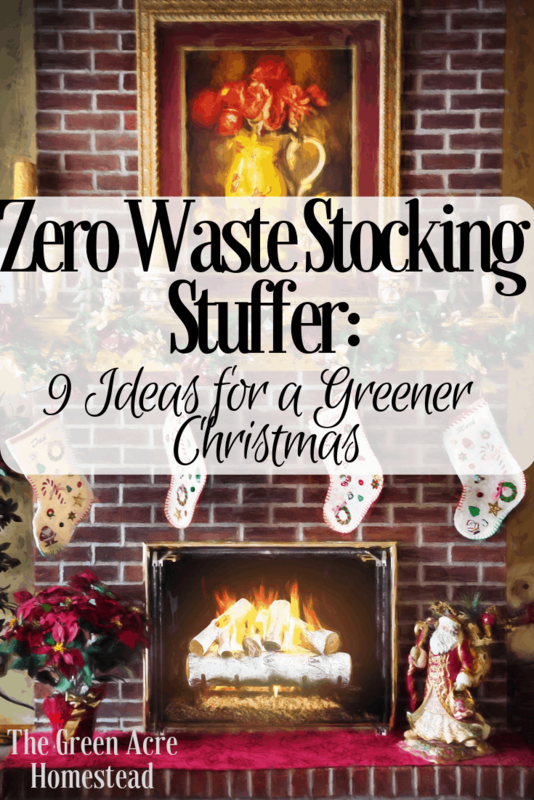 What other great zero waste stocking stuffer items can you think of? Leave your thoughts in the comments below and then get to stuffing those stockings! You can also check out these great Gift Ideas for Homesteaders! Just FYI: the only link that is showing up on my browser is the Simply earth. Could you possibly email the other links so I can at least look at the items? I’m really interested kin seeing them! Hm, that’s odd. Do you have pop-ups disabled on your screen? It shouldn’t show up as a pop-up but maybe for some reason, they are! But yes, I’d love to send you the links. Should I send them to the email you linked up for this comment? I am going to check out these reusable sandwich bags. Found you on Simple Homestead Blog Hop. I really love them! Let me know if you try them out and what you think. Thanks, Candy! Great tip, and suggestions. I love that so many people are becoming more aware for our environment. Thanks, Chas! And yes, I totally agree. Maybe if we all act now we can reverse a few of our general mistakes! LOL Thanks for stopping by!